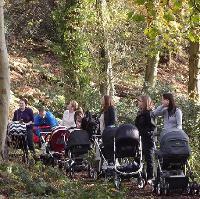 Please arrive 10 minutes early to complete a health questionnaire when you attend your first pram walk. This walk is not suitable for children who want to walk alongside their parents/carers. This so that we can walk at a brisk pace, and you can get some exercise! If you have children who want to walk along with you, our Toddle Together on the first Wednesday of every month may be for you.